America’s impressive gross domestic product makes it the richest country in the world, monetarily speaking. However, it’s equally rich in history and patriotism. As the days get a bit longer and hopefully warmer, it’s time to consider how to best acknowledge the upcoming patriotic holidays: Memorial Day, Flag Day and Independence Day. America-themed promotional products are a great way to share nationalism and pride with customers and employees. Memorial Day 2014 is May 26, the first of the spring and summer patriotic holidays. This holiday, formerly known as Decoration Day, was created to remember and honor citizens who died in the armed forces. It was first officially celebrated in 1868 in memory of those who died during the civil war. In 1971, Congress determined that Memorial Day would be celebrated on the last Monday in May. Flag day is celebrated June 14, the anniversary of the American flag. It was on this day in 1777 that the Continental Congress approved the nation’s newly designed flag. Like our current flag, there were 13 red and white stripes. However, just 13 white stars decorated the top left corner to further represent the first 13 states. 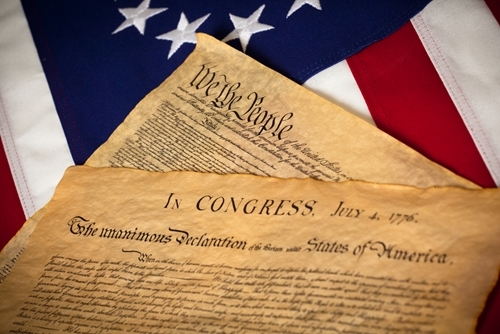 Independence Day, also known as the Fourth of July, is observed July 4 every year, regardless of the day of the week. It represents the adoption of our Declaration of Independence in 1776 and is often celebrated with extravagant firework displays. Make the atmosphere exude patriotism with themed decorations. To give the feeling of a summer-long affair, stop by a nearby party store. Get a healthy supply of red, white and blue streamers. They can be used to hang from the tops of doorways to create an exciting entrance or looped from the ceiling in a scalloped fashion. Balloons with the tri-colored theme will fit nicely with the decor as well, perhaps with various shades of blue for aesthetic depth. They should be filled with helium if they are meant to float, but an alternative thought is to scatter them around the floor. Balloon soccer or keep-it-up, anyone? Purchase a few banners to hang on large blank walls so the streamers aren’t overdone or overwhelming. Packs of mini American flags don’t cost much and are an ideal patriotic decoration. Spread them around the office, hand them out to clients and encourage employees to affix one to their desk. Before we get into the menu, let’s talk setup. Grab a few captain’s chairs or waterproof picnic blankets for guests and don’t forget umbrellas or rain slickers in case of poor weather. A few coolers are essential to keep food and beverages fresh and out of the sun. The best way to celebrate the patriotic holidays is with a good, old-fashioned American cookout. A traditional menu would include hamburgers and hotdogs, but barbecued chicken or other grilled meat also works well. Really, the most important aspect is the grill. Don’t forget vegetarian options! One option for a themed side dish is a red, white and blue sweet summer salad. Blueberries, strawberries and feta cheese decorate a bed of romaine lettuce and taste delicious together with a drizzle of sweet poppy dressing. For dessert, provide an assortment of ring pops in honor of letting freedom ring. Having a few games on hand can always liven up a party. Check out this beach ball in a bottle or custom paddle ball beach set to bring along and keep guests entertained. Other fun activities include an organized ultimate Frisbee game with a 10-inch collapsible flyer or jump rope competitions.